A new study led by Wendy White, an associate professor of food science and human nutrition, shows that eating salad with added fat promotes the absorption of eight different micronutrients that promote human health. Conversely, eating the same salad without the added oil lessens the likelihood that the body will absorb the nutrients. White’s study found added oil aided in the absorption of seven different micronutrients in salad vegetables. Those nutrients include four carotenoids — alpha and beta carotene, lutein and lycopene — two forms of vitamin E and vitamin K. The oil also promoted the absorption of vitamin A, the eighth micronutrient tracked in the study, which formed in the intestine from the alpha and beta carotene. The new study builds on previous research from White’s group that focused on alpha and beta carotene and lycopene. So a spoonful or two of healthy salad dressing may indeed help you derive the optimal nutritional benefit from your veggies. We aren’t proponents of soybean oil for various reasons, two of them include: most soy is genetically modified and that type of soy acts as a form of estrogen to the body which nearly everyone will find detrimental to their health. The oil we suggest would come in the form of avocado, olive, coconut and grapeseed oils. While this is a new study, our Director of Research Michael Donaldson, PhD, recommended to us 10 years ago, that consuming our BarleyMax with our meals would actually enhance the absorption of the nutrients since our meal would likely contain some fat. It appears that science has finally caught up with Hallelujah Diet! The phrase “A spoonful of sugar and the medicine goes down”, however, has no credibility as sugar has been proven to be harmful to the body so if it were added to medicine, then the negative synergy would likely prove even more deadly. I did not realize that the reason soy has a negative effect (mimics estrogen) on the body is because it is genetically modified. It is good to know that healthy fat helps the body absorb nutrition from our foods. FAT IS FABULOUS. It makes food taste better. It helps a person feel satisfied. Our cells need fat. That is why I am opposed to the diets that tell us to cut out fat. 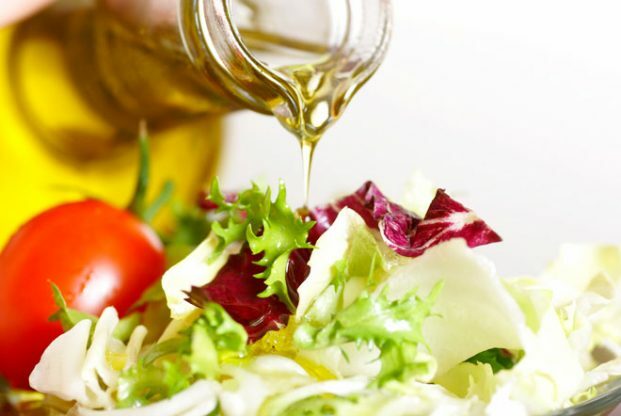 Unrefined oils are great on salads, steamed vegetables, quinoa, rice, potatoes and more. Nuts and seeds are another way to incorporate healthy fats on salads. Is there really such a thing as unrefined oils? To learn all about oils, the book “Fats that Heal Fats that Kill” is a wealth of knowledge. When I purchase oils that have been labeled “Unrefined”, they taste like the item they came from. They are delicious and do not taste rancid or flavorless. I LOVE the brand Flora. Hallelujah Diet carries their Flax Oil. Their pumpkin seed oil is so delicious, I could drink it. It is dark green. These oils are produced and bottled in a meticulous manner to maintain freshness and nutritional content. Good information to know about when we sat to eat our salads. There is some great salad dressings we can make with good oils. Thank you for this article, good to know we can eat our salads and have healthy fats drizzled on top! Am I understanding correctly that it is now recommended that we drink our Barley Max with meals? I’ve believed for a long time that we should take it on an empty stomach. I have been thinking that fiber reduces the benefits of the Barley Max. Can someone straighten me out on this? Thanks. Hi Mary Beth, when BarleyMax is consumed with meals, the fat from the meal will help with absorption of fat soluble nutrients. If you drink it between meals, adding a tsp. of flax oil or eating a few seeds or nuts along with the BarleyMax will have the same effect. Excellent information! I so appreciate how your researchers are always on top of things. It really establishes great trust between Hallelujah Acres, Health Ministers and their customers. I would not be promoting oils. Healthy fats from food to put on salads, yes. Make dressings with nuts and seeds and avocados but not oils. See Esselstyn, McDougall, Barnard to learn about the effects of oils on arteries! Not to mention the calorie density of oil! There is a great book called, “the Blue Zones Solution, Eating and Living like the World’s Healthiest People”, by Dan Buettner. It studies 5 of the healthiest and longest living cultures in the world, through a team of leading medical researchers, anthropologist, dietitians, demographers, and epidemiologist as well as collaborating with local researchers who were studying centurions, and interviewing a representative sample of 90 and 100 year olds in all 5 areas. They put together what these groups ate. It is very fascinating to see. In Ikarai, Greece and Sardinia, the people enjoy olive oil.